I recently cautioned viewers about watching the Cathedral of Learning falconcam because the female peregrine killed and ate some of her young last year as they hatched. I didn’t know if she would repeat this behavior. Last evening she did. The first sign that Hope would kill the hatchling was around 6:15pm when she picked up and carried the hatching egg (above). Carrying is not normal. Half an hour later she killed and ate the chick and its eggshell. Hope and her behavior were new to us last year. We didn’t know if she killed and ate some of her young because she was under many stresses: a new home at the Cathedral of Learning + loss of her mate + finding a new mate + other females challenging her while she was incubating the eggs. This year none of those stresses apply. None of them. And yet Hope killed and ate her first hatchling last evening. Last year one chick survived. This morning it appears that Hope has spared the second chick. 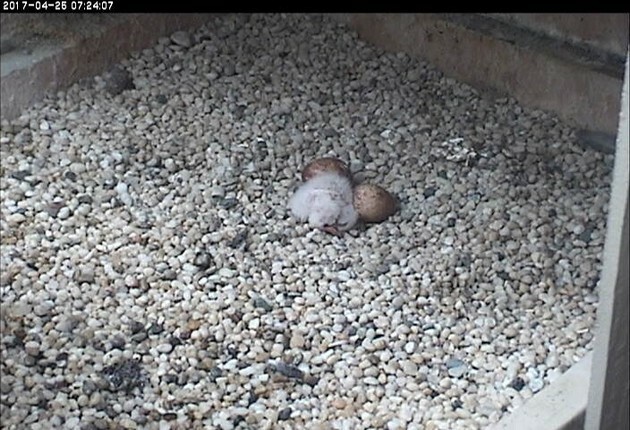 Here’s a snapshot showing there are no longer four eggs/chicks. Now there are only three. But the chicks and eggs aren’t safe yet. The remaining two eggs might succumb and last year when a second chick hatched successfully, it died within a week. It failed to thrive. Some speculated that Hope starved it. We don’t know why Hope does this but we now know it’s not a one-time event. She may have done this all her adult life but there was no camera at her former nest site, the Tarentum Bridge, where she fledged 0-to-2 young per year. Again, do not watch the Cathedral of Learning falconcam if it upsets you to see a mother kill her young. The Gulf Tower in downtown Pittsburgh has a beautiful peregrine family with three chicks. Please watch the Gulf Tower falconcam to learn about normal peregrine behavior! P.S. on the subject of names: At the Cathedral of Learning we use “C + Hatch Number” as the naming scheme for chicks. Last year had 4 chicks (C1 through C4) but only C1 survived. This year C5 was eaten, C6 is the now live chick. I will write more about names in the days ahead. is it unusual for two eggs to have hatched within a relatively short time span? I thought there was usually a longer period between each hatch? 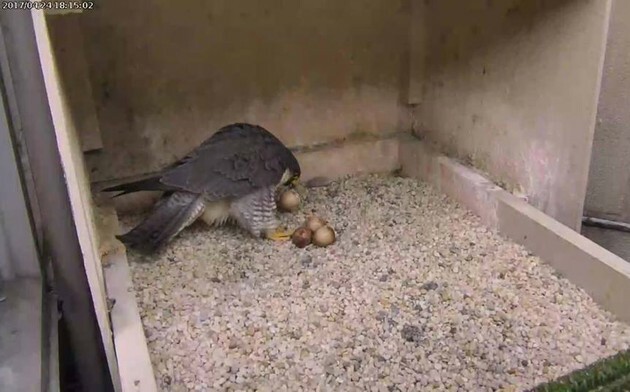 Sue Vertosick, it is normal for peregrine eggs to hatch within hours of each other. Peregrines’ delayed incubation means that many hatch within 24 hours of each other. I don’t know if this has been addressed or if there even is an answer but based on her behavior could Terzo abandon Hope or would he remain with her as long as she controls the nesting site? I would imagine this is strange to him as well based on what he is hardwired to do as a parent. Sheryl, peregrines are more wedded to the site than to the owner of the site. I believe Terzo is likely to stay. That said, I have no idea what these birds will do. Thank you Kate, for what you wrote. I couldn’t have said it better myself. The Gulf Tower is the place to watch. They are beautiful. Sure wish we had a DORI or DOROTHY at Pitt. Oh DOROTHY! What a wonderful time that was! Oh dear, such sad news. Kate, have you read of any other cases of PEFAs or raptor in general that engage in this odd behavior? Thanks for the update. Your doing this for us means that I don’t have to watch; instead, I can keep my attention on Gulf Tower. Man, do I miss Dorothy at the Cathedral! Pa Gal, Hope’s behavior is so rare that I’ve only hear of it in one other place (a scientific study site). Most peregrine nests don’t have cameras so we don’t know if it occurs at non-camera sites. On the other hand, peregrine falcons would not have recovered from extinction in eastern North America and would not have come off the endangered list in so many states if they normally killed most of their young. Kate, have learned a lot from you and from being able to view the cameras over the last several years. Certainly hope that that opportunity will continue. Would hate to see them shut down. Thank you to you and to The National Aviary for all that you have done to help educate us in regards to some aspects of nature. On the subject of names: At the Cathedral of Learning we use “C + Hatch Number” as the naming scheme for chicks. Last year had 4 chicks (C1 through C4) but only C1 survived. This year C5 was eaten, C6 is the currently live chick. I will write more about names in the days ahead. Kate, I know this behavior is as unsettling to you as it is to the rest of us. Your calm, level-headed reports are much appreciated. As upsetting this behaviour may be, it also is an opportunity to gain knowledge. It may not even be intentionally of Hope that she kills her chick(s). Maybe she just wants to “help” the hatchling, resulting in harming it and eventually terminating and eating it (waste not, want not). And maybe she doesn’t learn from previous experiences, is not able to change her reaction and behaviour. Two days ago something similar seems to have happened at a Dutch nest; egg hatching, chick almost out and then the mother started pecking at the egg. Quite possibly this caused a premature separation from the yoke which can lead to unstoppable bleeding and ultimately the death of the chick. The remains of the chick, still with half the egg shell attached, were taken out of the box by the female. The other three eggs hatched successfully and all is well now at that nest. Ingrid, thanks for telling me about the incident in the Netherlands. There’s always more to learn. Thanks for all your updates on the falcons, and do please keep speaking up about the risk of the camera being shut off – I had no idea that was a possibility, and would hate for that to happen. Either way, keeping my fingers crossed for happy outcomes for C6-8! Stacyj, my thoughts have evolved about the chick that failed to thrive and died last year. After thinking it was not intentionally starved I wondered (as many of you did) if Hope was feeding it equally. I don’t know. It is fishy though. Kathi, peregrines are more wedded to the site than to the owner of the site. I believe Terzo is likely to stay. That said, I have no idea what these birds will do. Thank you so much for the update on Hope and the chicks. I will wait until the chick is older to start watching again. Hope did a good job with C1 last year, C1 was a handful. I remember Terzo stepping on the chick that failed to thrive, I didn’t realize Hope starved it. I got worried yesterday when by late afternoon, the hatching had not progressed. For some reason, I felt the longer it took the chick to hatch, the more likely Hope would kill it. Is it possible that the chick did not survive the pip, similar to the 4th egg of Dorie’s? If that could be the case, Hope may have recognized it and then proceeded to eat it. Is it confirmed that the chick was alive when she ate it? JenK, we don’t know what condition it was in when Hope ate it. Her back blocked the camera. Regarding Hope’s behavior, we do know that it is abnormal to pick up and carry an egg. And yes indeed she ate the chick and that’s abnormal, too. I think this is an important reminder that nest cams, while fun to watch and a great opportunity to see nature up close, aren’t just reality tv – they hold scientific value through capturing data that provide ongoing insights into species behavior. Thanks for keeping us all posted on what unfolds. Clearly not a fit trait, and the exception in nature. Hopefully next year a new female will win the Pitt nesting site. I was wondering if while the female is incubating eggs is the male responsible for bringing food to the nest for his mate. If he is not bringing back enough food would her first instinct be self preservation? Lisa, the male stays nearby and waits for the female to signal that it’s time to bring food. The camera view is too narrow to show the male nearby. UPDATE: At 1:40pm I was at Schenley Plaza and could see the male, Terzo, perched on the nestrail above the camera, looking at Hope in the nest. I realize that we really can’t know why she’s doing this for sure, but have there been any falcon experts who have offered possible explanations? I believe there have been some (rare) other instances of falcons behaving this way, haven’t there? Hope obviously knows how to raise a chick well, and had been doing everything right this year up to the point of the first hatching. I would assume there’s a biological cost to her in laying and brooding eggs, and obviously she’s not killing these chicks just to be mean or because she’s lazy or a bad mother or whatever … it’s hard not to speculate on her reasons but I’d love to hear from people who have actually been studying peregrines or other birds professionally – has any actual ornithologist offered any theories? Stacyj, there are theories (many discussed last year) but no one knows. It would take a long time to list them all & this is so rare that the theories have almost no other incidents to back them up. I remember one incident last year where Hope fed C1, then turned to take the prey away. C3 was loudly vocalizing (for food, I believed) and Hope turned back and fed more to C1 and nothing to C3. I thought that was odd at the time, but didn’t have the time to dig through the archives to see if that was normal or just a one-time situation. I also remember Hope carrying C1’s egg around the scrape while C1 was trying to hatch. Hope is quite a puzzle. Thank you for keeping us updated, and for your calm and concise explanations of everything. Hopefully the researchers who own the cam can learn from whatever happens. This nesting site is so ideal to raise little ones. Still hoping for success this year. little puffball is so cute. Just heard Hope talking to her baby. Hopefully rest of hatching will go smoothly and we can enjoy watching them grow and flouish. Hope is such a beautiful bird. Who knows why these things happen. Kate, I’m wondering if we have any way of knowing how closely genetically related Hope and Terzo are, since they’re both banded? I am wondering if some chicks have some sort of deformity that Hope can tell but we can’t. While her behavior is alarming to us, there must be some explanation of why she chooses to raise at least one. Alyssa, Hope & Terzo are banded so we know they are not related. Dorothy and E2 (former residents at the CL) were grandmother and grandson yet this *never* happened when Dorothy was in charge. The bottom line is: Hope is not the careful mother that Dorothy was. Many times I think about the disappearance of Dorothy and the appearance of Hope. The thought of Hope taking this site FROM Dorothy makes me sit back and sigh. What we all watched Dorothy do in 2015 was nothing short of remarkable. To lose Dorothy to this replacement would be ironic. Only Hope knows why she does what she does and we will probably never know the reason. Her instincts are more in tune to the situation then what we can observe. I also wish for a normal hatching but this is nature and out of our control. hope does not purposefully kill young. She was trying to help it hatch . she just never learned how to let them come out on their own. unfortunately in the process, first chick died and it is natural to consume the chick. HOpe is not not a bad falcon . she was a good mom to her chick . I will not go into things here as this is to be positive and I have a soft spot for HOpe and sometimes things are just not what they appear. just wanted to clear up the assumption, she kills her chicks on purpose. This is such sad news. I almost hope he remaining eggs do not hatch . I’m not watching the cam that often, so thank you for keeping us posted on what is happening. I have been watching the Gulf Tower. I hope the chick survives and thrives and that the other eggs/chicks do as well. I agree that people should keep their unrealistic expectations for wild animal behavior to themselves. I want the camera to remain. Who knows how long Hope will retain her position there. I, personally, would like to see her overthrown, but I also believe it should happen naturally. interference results in the loss of their offspring so next time they don’t repeat that earlier behavior. Now in a human if someone kept doing the same thing over and over with the same negative results, you’d say they had a learning disability or you’d say unkindly they are stupid. an amazing ability to adapt from nesting on cliff sites in the wild to nesting in cities. I think that proves they aren’t exactly ‘bird brains’ and science agrees with that assessment. course of action, instead like a broken record, she keeps repeating the same behavior over and over again. hatch….that is hard wired into them or it’s not. Logic and science. Just my two cents. Although difficult to watch, I must say it’s food for thought. nest? Hadn’t Dorothy already layed eggs and did Hope incubate them? Thanks. Do you think this terrible “trait” could be inherited by her offspring who would behave the same as Hope with eggs of their own? Bethany, we don’t know what causes it; we don’t know if it can be inherited. Let’s “hope” its just faulty imprinting and not genetic, otherwise Hope could spawn a whole race of mutant cannibal peregrines! Although who is to say that one very healthy, well fed, pampered chick per year may not be a viable alternate reproductive survival strategy as compared to a brood of several that have to vie for attention and nutrition resources? Be interesting to see C1 as a mother. ‘Hope’ she turns up on a webcam someday. Wondering if the Game Commision would consider taking Hope to the Aviary or something after this year’s breeding season? If her babies are dying because of her she isn’t contributing to the rebounding of the species, and it would allow maybe for a more productive breeding pair? HazritHazit, no, the PGC will not intervene in that way. However, they may try to get data on what’s causing her to act this way. Ev, you are remembering Dorothy’s last chick (with birth defects) from 2 yrs ago. Yes, Hope does travel from new site to old site and back, but that might not be very unusual. We happen to know she does it merely because we have a webcam at one site and great photographers at the other. Robin, you make a couple of good points. Dori is 10, hatched in Akron, Ohio in 2007. (She arrived at the Gulf Tower in 2010.) Louie is 15 years old. He’s Dorothy’s son, hatched at the Cathedral of Learning in 2002. Is Dori 7 or 10 yrs? Your peregrine facts page says she was hatched 2007 in Akron. If she is 10, is she nearing the end of her reproductive years? Lauren, you caught my typo (which I’ve corrected). Thanks. Dori arrived in 2010, hatched in 2007. She is 10 years old. Regarding Prime of Life: Based my experience with Dorothy, age 10 is just fine. Dorothy was more productive (more healthy chicks) in her 11th & 12th years than even in her 10th. Could Hope just lack confidence? Or maybe she has a more predatory instinct than a maternal one. Mary Jill, I don’t think confidence or instinct plays a part in this. Hope’s behavior is very abnormal (not instinctual). She may have an physiological problem not found in normal peregrines. 4:56 – feeding time for C6! I’m glad to see that that’s going well for now. Kate I may have missed it has Hope’s chick been fed yet? Connie, look at Stacyj’s comment just above yours. Yes. Has been fed. I just looked at Hope and she’s eating a shell. Is she killing another newly hatched chick? Bethany, check the other comments after yours. Second chick fully hatched just now. 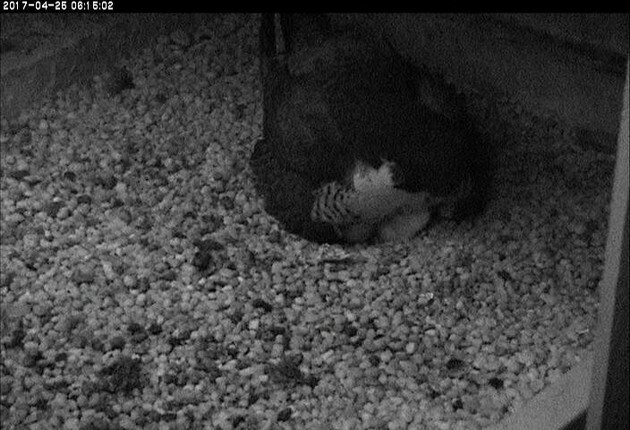 Mom ate the shell and so far she is shielding the new chick. I hope it survives. Around 5:30 it looked like Hope was pulling a baby from an egg. She seemed pretty aggressive toward the chick/egg, but baby still seemed to be moving when Hope moved over it. Hope then continued to eat the egg. She is eating something now. Hard to see with her back to us. Sure hope it isnt another chick. Would like to see at least two fledge from this nest. They are so much fun to watch. It looked like she was eating rocks for the last several minutes. Could she be missing something from her diet – maybe she has been trying to eat the egg shells and killing the chicks who are still hatching in the process? Just got a glimpse of what looks like two live chicks at the Cathedral of Learning. Keeping fingers crossed. Just wondering is the male bringing food to the nest? I see feathers at gulf nest so I know food is being brought, but never see that at Pitt nest. Patricia, the male is bringing food and has food ready and available (a cache of food) close by. When chicks are very young the female controls whether food is presented to them. Hope has not signaled Terzo to bring food as often as Dori has to Louie. Terzo is present and waiting, very close, though you can’t see him on camera. Note that the chicks at Gulf Tower are older than those at Pitt so more food has been consumed at Gulf. 6:15 AM this morning, there are two sweet hungry babies and one egg remaining. Was so happy to see this! 6:25 AM, food brought to nest and both are being fed. Good News. Two cute sqirmy little babies – safe and sound! And are getting fed now. 9 am, Hope brought food to the nest as Terzo was incubating. Terzo left as Hope fed the chicks, although her back was to the camera, but both chicks look well. At the end of the feeding, the prey’s leg/foot got tangled in Hope’s band on her one leg and it took a minute or so for her to get it free. She disappeared with the food and Terzo came back again to incubate. I could not see a visible pip on the remaining egg. I look in on the Pitt site every once in a while but not often. However the Gulf cam has been down more than up. Wrote last night because I Couldn’t even catch them on the archives. They said they’ve been having trouble. I wish they were having trouble with the Pitt site!! That being said is there any chance that another falcon could challenge Hope for the site. She seemed to go back and forth to the bridge last year. Mari, yes another falcon could challenge Hope but the most likely time for that is next March … Almost a year away. Happy to see the 6:25 am feeding this morning on archives. (also happy archives are now playing again!). I watched Hope feed both eyases, alternating between the two so both got equal amounts. That was very encouraging! Good Morning, there are 3 beautiful chicks with Hope. So happy to have seen them. Margot, the camera view isn’t close enough and I want to be sure before I get excited. I’m waiting for Hope to stand up so I can count heads. Question: what would have happened if he never came back? Is the female capable of raising a young brood by herself? Regarding your question about Hope being alert and watchful. Answer: Hope does this when she sees Terzo coming back with food. If he has time to prepare it he takes it to another part of the cliff (building) before he delivers it to the nest. I have confirmed this by watching at Schenley Plaza (seeing Terzo as I stand below) and checking the falconcam simultaneously on my cellphone. Regarding your question: What would happen if he never came back? Answer: Last year E2 never came back during egg laying so Hope found a new mate (Terzo). If one of the adults disappears while the chicks are in the nest, the remaining parent hunts and provides for them. When a new mate arrives on the scene, the solo parent often excludes the new mate from helping with the chicks until the two adults get to know each other.